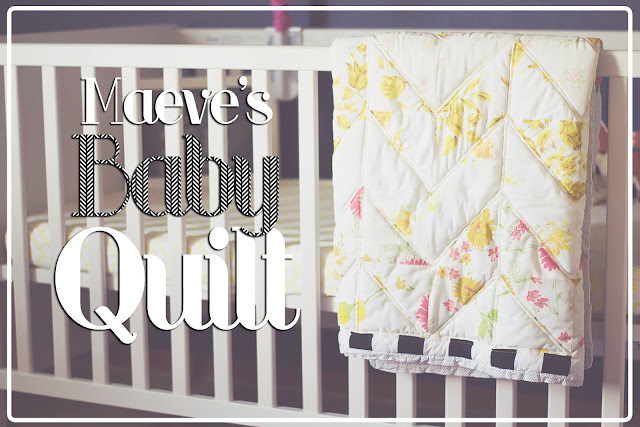 Baby Maeve's quilt was the most difficult project I ever had to complete. Probably because being pregnant really just made me want to nap, like all the time [thank you anemia!]. It was a struggle to convince myself to sit down and work on this. I wanted it done by time she got here but ohhh, I just didn't want to touch it either. I managed to power through and get it done, I'm so glad I did. I just hugged it, all the time. I wanted nothing more than to cuddle my sweet baby girl and she was being stubborn about arriving. So until that time, I had a blanket to hug. 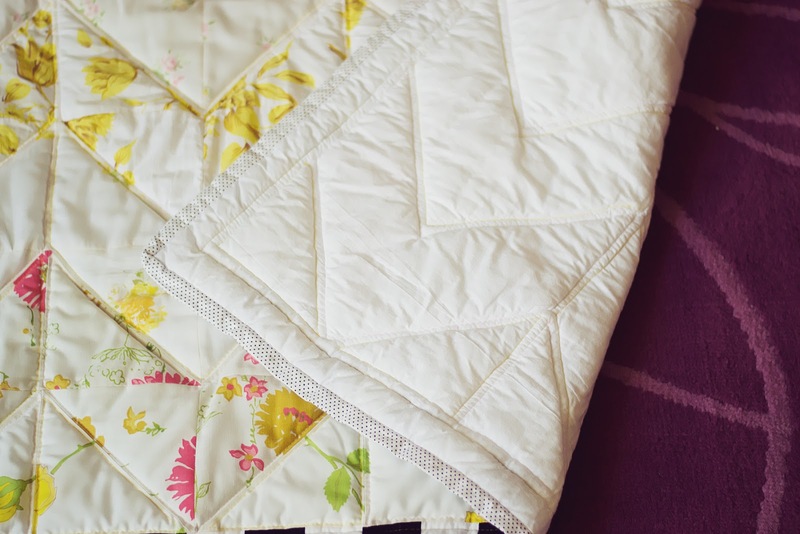 I made her quilt using vintage sheets I collected from sellers on instagram. I collected these sheets two years before she was even conceived and called them my hope scraps. I wanted a daughter badly, I love my son but I yearned to have someone to put in dresses and top with bows. I looked at many designs and finally decided to do this "zig zag" because I wanted to quilt it to look like arrows. I didn't go native with her nursery design, at all, but I'm so eclectic I wanted to add a piece of that in subtly. My original idea for a girl's room involved lots of yellow, though I strayed from that later on, I still kept the yellow in her quilt with pops of pink. 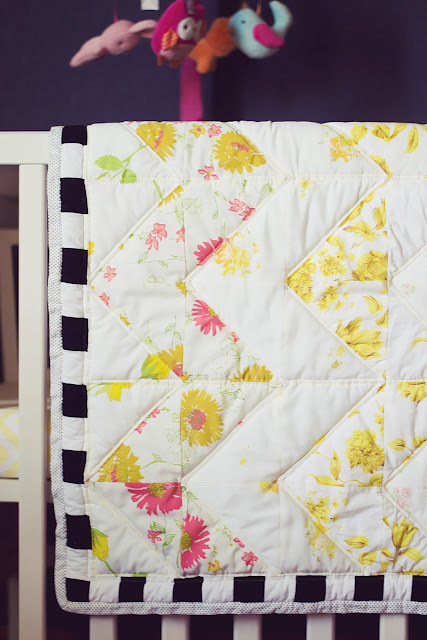 I love how the quilt is set off against her blurple wall, so it was a total win. Once I got my pieces together I just wasn't happy, it wasn't complete. So I began experimenting with different designs for a border. The down side of using vintage sheets was my limits, I couldn't just run down to the fabric store and pick up more of this or that, maybe grab another coordinating fabric. Nope, I was stuck with what I had. But I couldn't make it work so I began to dabble with solids and decided to do this black and white border. If I recall right, I had already picked the polka dot binding, so that's why I was drawn to the black and white "stripe." It turned out great, I've received a lot of compliments on the pop the border makes, so I'm glad I went with my gut and did it. The polka dot binding was originally going to be my small touch of black and white, but when I put just that against my blocks it seemed like it still didn't quite work. Which is why I added the small border and then the binding. Now I love it! 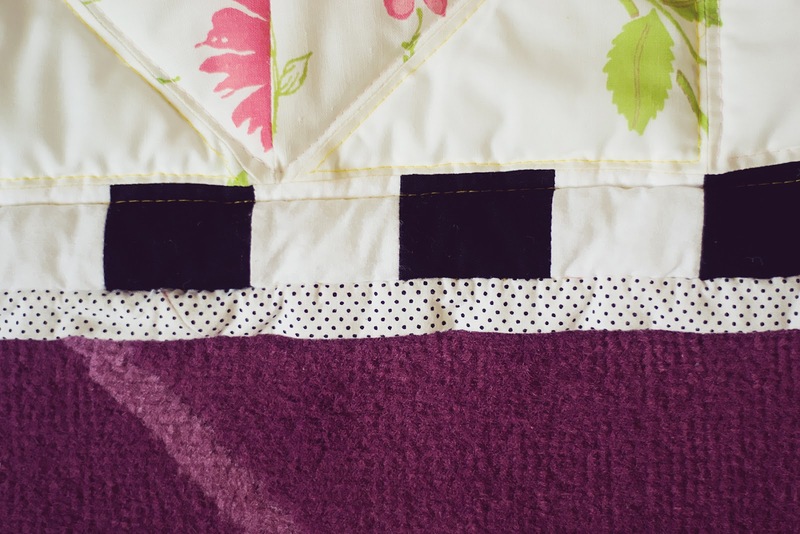 I also finally learned to slip stitch my binding on to make it seamless and pretty. It's a little wonky, but it was my first try. I've done it on a few blankets since then and it looks great [Yes, I've made blankets since my baby was born. Mom needs a hobby!]. On the back, I originally planned to use this vintage poppy sheet I had, but I just could not bring myself to cut it. So I used solid white cotton, because it was the easiest match I could make last second. 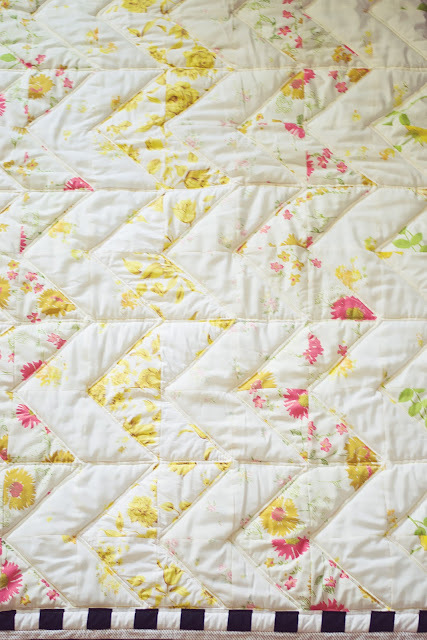 I probably could have shopped Etsy for more vintage sheets, but I wanted to get this baby done. I love how the quilting looks on the back. 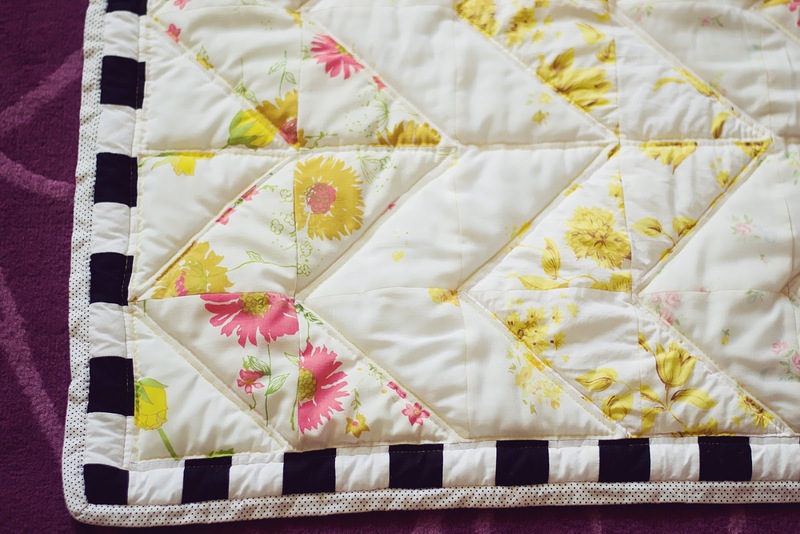 I quilted with pink and yellow thread, so the colors show on the back. It's easier to see in real life, sorry. 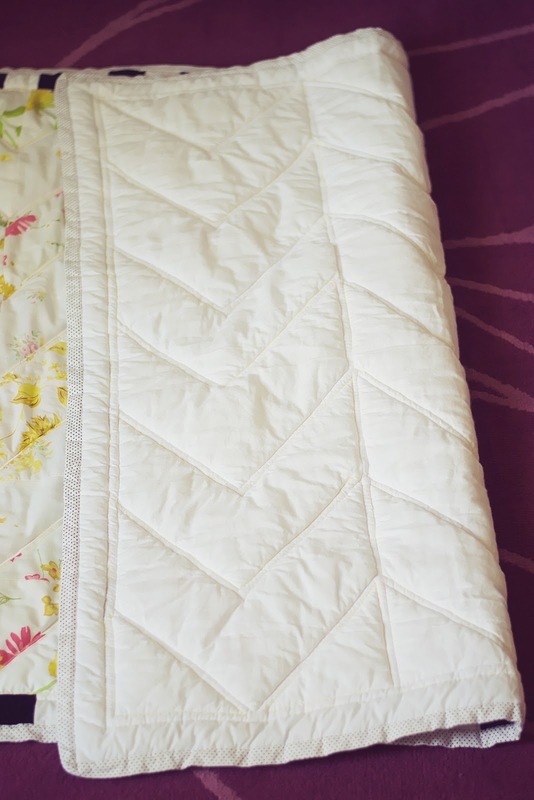 I also chose to use a thick batting inside to make the quilt super puffy, the idea being that baby will play on it more than she will sleep with it. It's too big and heavy to be in the crib with her, so I planned for it to be more of a play blanket instead. I lay it out on the living room floor for her to play on almost everyday. Plus, it's super fun to squeeze, like a stuffed animal. I am really happy with how this turned out. It's far from perfect because I struggled with the vintage sheets so much, some of them stretched as I worked and made the quilt less than a proper rectangle. But that's okay, it's made with love, from Mom to Baby. It looks beautiful in her room and works with the sheets I received as gifts, a yellow zig zag and a gray with white polka dots. 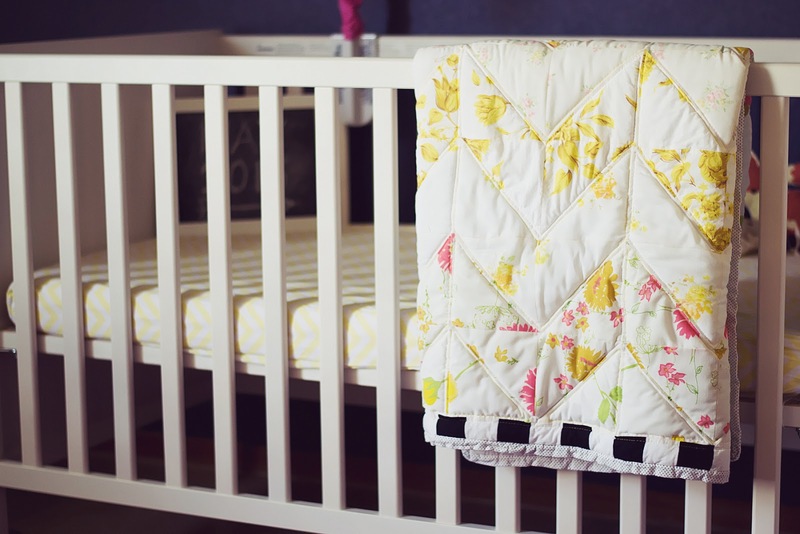 I'm glad I held on to those vintage sheets for so many years, I started to have my doubts about having another baby and then once I was pregnant, I kept thinking: "What if I have a boy!?" I suppose I would've been making new plans. This is probably my last quilt for this year with the holidays moving in. 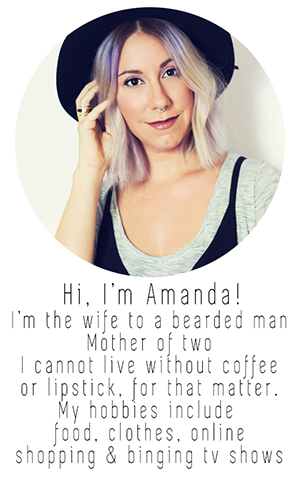 No one else has announced a pregnancy at this time, so maybe, just maybe, my next quilt will be for me.